While we were watching fireworks we needed a wee warming drink. Now while you may all believe the Brits all drink beer, there is another quintessential English drink - pimms. The most widely known is Pimms No.1. This is drunk in the summer time with lots of fruit, mint and loads of ice. Generally served in jugs. Pimms No. 3 is also known as winter pimms. Served warm like a mulled wine. I love brandy - I am definitely going to look out for that Pimms teapot next time I am out and about. great post! Mmm… sounds like my kind of drink, especially no. 6 (no. 3 sounds yummy, but too warm for our climate). I love the tea kettle stall! That is just the cutest thing ever! Are all their shops like that? We fell in love with Summer Pimms while living in England...not so much the Winter version though. Very cool 'thing' and shot too! The matching shirts make their contribution to the composition. I'd never heard this before. Thanks for the "cup" rundown - it was really interesting. 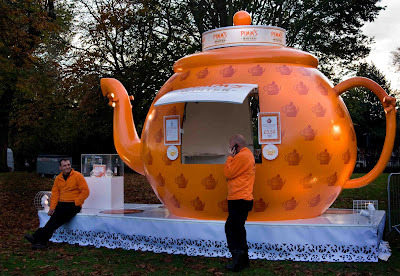 Is orange the Pimms colour, or do they make different coloured teapots? Just curious...I love the brightness of this colour. I've heard of Pimm's but I never knew what it was. Blimey, I never knew this! First you teach us how to make fireworks and then Guy Fawkes and now Pimms! You are like a CDP encyclopedia! I have heard of Pimms but had no idea there were so many versions. Now you've inspired me to see if I can find some and give it a try. I've never heard of Pimms before. Yet we do enjoy Pimms No. 1. a splash of tonic and lime. I know Pimms. I don't like it though. Lts of it sold around christmas.